A big concern for investors throughout this year has been the escalating trade war between China and the US. So investors were closely watching the meeting between US President, Donald Trump, and Chinese President, Xi Jinping at the recent G20 (Group of Twenty) summit. Investors were hopeful – though sceptical – that something positive would happen. And as it turns out, the outcome of that meeting has been quite positive, particularly in the short-term. 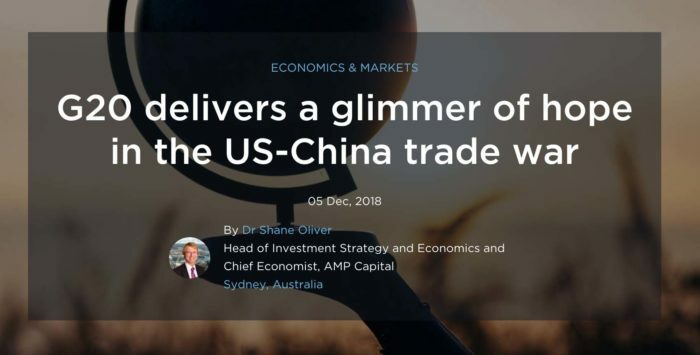 Markets find the positivesChina and the US agreed to put further tariff increases on hold for now, at least for 90 days while they negotiate a whole bunch of other issues such as forced technology transfer, the protection of intellectual property, cyber hacking and tariffs. Most of those issues weren’t previously on the table. Markets across the world were looking for some good news and reacted positively, at least initially, pushing global stocks higher. In Australia, the ASX200 surged 1.8% – the best day in two years. Just a truce?Yet already people are questioning what happens from here. Obviously, March 1, when the 90-day period ends, becomes a milestone date. Others are discounting what happened at the G20, saying this is just a temporary truce and that after March 1 will we back into a trade war all over again. Personally, I think the outcome from the G20 is positive and gives us cause for some optimism. There are a couple of reasons for this. Firstly, as it occurred between the two presidents directly, this deal suggests buy-in at a high level this time around. And secondly, the Chinese seem to have given some ground by agreeing to negotiate on issues such as intellectual property theft and forced technology transfer, which they haven’t wanted to discuss in the past. That’s a pretty good sign they’re focusing on issues the US is concerned about. So, in that sense, my feeling is that some confidence that this time around there might actually be progress is warranted. Not going backEarly in 2018, the risk of a trade war seemed a bit academic. But the situation escalated quickly and the trade war is already impacting confidence in China, and the US where it is weighing on capital spending by companies. By the time we get to March 1 next year, I believe it’s highly likely that either the US will agree to further delays in the imposition of more tariffs, or they will have come to some sort of agreement with China that ultimately leads to a complete de-escalation of the trade war. So while there’s still a lot of uncertainty about what might happen in March, what we saw at the G20 was good progress and give us some sign that we won’t see a return to the trade war that started to emerge in 2018.